6.2. Why Manage Access Tokens Directly? MOVEit Transfer keeps important files and data secure when information is at rest or in transit. MOVEit is ideal when you handle data that requires integrity checks, audit trails, or robust policies and controls needed to ensure confidentiality. 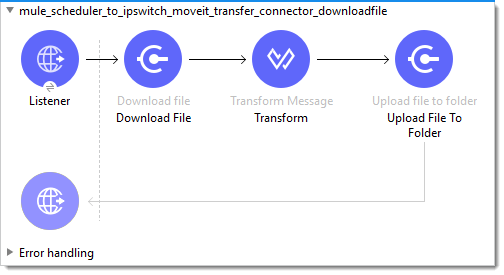 MOVEit enables you to verify file/payload integrity for content used from (by way of MOVEit Transfer download) or output from (Transfer upload) the MuleSoft integration platform and a MuleSoft flow or subflow in Anypoint Studio or CloudHub Design Center. Events involving MOVEit data are logged, and upload and download actions can be subjected to data loss prevention rules and anti-virus/malware inspection. MOVEit Transfer is an enterprise and cloud FIPS 140-2 compliant managed file, folder, message transfer, and collaboration system. MOVEit was designed for information assurance policies that expect confidentiality, integrity, and accountability. This design helps organizations, groups, and business units adhere to data security standards such as HIPAA, SOX, PCI, and much more. MOVEit policies can be configured and refined on an organization, group, user role, and even folder-specific basis. Patient, personnel, and customer data. Signal (voice) or image (picture or video) content that includes PII (personally identifiable information). Valuable predictive analytics or machine learning models. And much more…​(any content or information that needs an audit trail and integrity checks when transferred or accessed). WS_FTP (client and server). Secure file transfer applications. MOVEit Analytics. Metrics, insights, and decision support for your managed file transfer operations. MOVEit Cloud. Provides the MOVEit Transfer feature set as enabled by your subscription. MOVEit on Azure. Run MOVEit Transfer on Azure (deployed directly from Azure Marketplace). WhatsUp Gold. Network, device, and application management --including discovery, monitoring, site-reliability, and reporting. 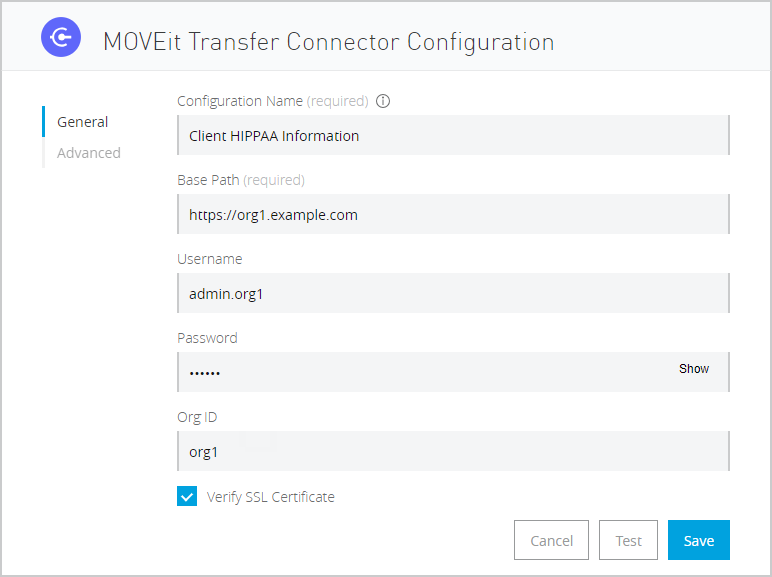 The MOVEit Transfer Connector enables you to modify, get, or save important data, files, and folders by connecting to a cloud or on-premises instance of MOVEit Transfer (or both) from the MuleSoft integration platform. The MOVEit Transfer Connector available through Anypoint Exchange expects to be run on the Mule 4 Runtime. After you launch a Mule Flow, MOVEit Connector uses valid user credentials to retrieve an access token from MOVEit. Create and manage users and groups, roles, home folders, and other properties. Create folders, manage folder actions, folder contents and folder properties. • Upload payload from the Mule Integration platform. • Download managed files and data from MOVEit. • A Flow defines a workflow. You initiate a Flow with a node that provides a trigger (such as duration to start-time, recurring schedule, HTTP or FTP message event, database transaction, and much more). • Flows are typically built and launched from…​ either Anypoint Studio (on premises) or Design Center (and run in "CloudHub" --the MuleSoft cloud). • Flows run against the Mule Runtime. 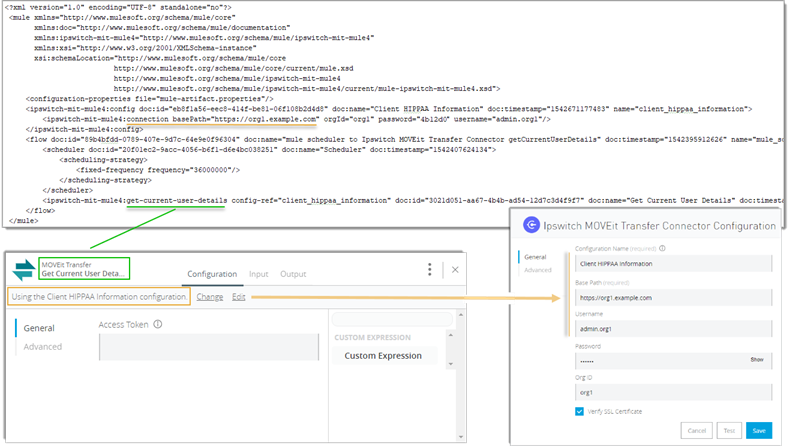 Your Flow configuration, (shown in the Figure as mule-config.xml) includes an entry for the MOVEit Transfer Connector and can include any one of a number of connectors and plugin modules designed to run on the Mule integration platform. Before you begin using the MOVEit Transfer Connector in a flow, you will need the items outlined in the following table. If you are trying this connector and the Mule integration platform for the first time, this section and the Getting Started section provide simple examples to get you up and running. Assemble and run the examples documented in this guide to become acquainted with Mule. After you become acquainted with the configuration and runtime elements of a Flow, you can take successful runs from Design Center, download the .jar file, and import/build/run them directly as an Anypoint Studio project. Design Center is a browser-based development environment that requires Internet access. Anypoint Studio is a desktop development environment. Its projects can be run locally or scaled out on premises. The connector is accessible from either Anypoint Studio or Design Center. The instructions and examples that follow expect that you have access either to Anypoint Studio or Design Center (or both). You can sign-up and sign-on to Anypoint Platform Design Center here. An instance of MOVEit Transfer that manages message, files, folders or data that you want to access. MOVEit Transfer version 2019, 2018 SP2, or 2018 SP1. Able to accept traffic from either an AnyPoint CloudHub or an AnyPoint Enterprise Edition (where fabric is run on premises). User’s Org ID (optional). This is necessary if the user exists in more than one org. It is best practice to use a dedicated user with access privileges that follow the principal of least privilege when connecting to your MOVEit Transfer system. The target MOVEit Transfer system requires the MOVEit API Add-on and the corresponding license to use the add-on. For MOVEit Transfer 2018SP1, 2018SP2, and the initial release of 2019, the add-on is subject to the terms of the MOVEit Transfer EULA. When you create a default user and connection configuration for a Mule Flow, the username/password pair requirement becomes optional. This connector expects Mule Runtime 4.0 or later and MOVEit 2018 SP1 or later. For details, see the MOVEit Transfer Connector Release Notes. Use these quick steps to validate your MOVEit user credentials and run the MOVEit Connector in Design Center. • Select a Trigger module (such as Scheduler). • Choose the function Get User Details. Delete the unneeded Dataweave transformer. When you create your project, Design Studio automatically inserts a Dataweave Transformer upstream of the Target you selected. For this simple 'How To' it will not be used. Delete it from the Flow. • Org ID. MOVEit Org ID (if this user belongs to more than one org). • Click Run to launch the Flow. • Open the MOVEit Transfer Get User Details module. • Click the Output tab. As a starting point for your next development project, now that you have successfully run the MOVEit Connector in this Flow, you can download the .jar file from Design Center and import it as a MuleSoft project into Anypoint Studio. When you assemble a Flow to be executed by the Mule Runtime, a configuration file contains the information necessary to load each module (such as the MOVEit Transfer Connector), inject runtime properties (such as configuration values), and run the Flow. The typical practice for assembling this file is through the UI controls in Design Center or in Anypoint Studio. Once you create the file, you can share it, reference it from within an Anypoint Project and repurpose it. For example, the Getting Started example yields a .jar file that contains a Mule configuration (mule-config.xml). The following code snippet is the mule-config.xml used for the Getting Started exercise. 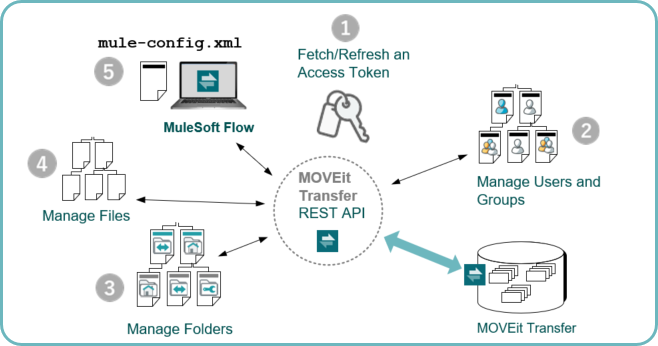 Accessing files managed by MOVEit Transfer from a Mule Flow enables you to integrate secure input and output data into simple or complex workflows. The following is a simple example of how to round-trip trusted content from MOVEit Transfer. Consider a scenario where you use the MuleSoft Integration platform to leverage data in an on demand workflow. This example shows you how to "round trip" --get trusted content from MOVEit, use/process it, and then push file changes (payload) back to a secure "In" folder. Set a trigger for the flow to launch. Process it (in this simple case, a large dataset is reduced). Upload the secure payload back to MOVEit Transfer into a Secure Folder. This round-trip managed file transfer example applies the Flow outlined in the following table. 1. Copy the service hostname. Pass in a file ID and get back a file from MOVEit Transfer. Payload: File streamed (non-repeatable stream) to memory. For more information, see the section titled Streaming Strategies. This module is a placeholder. It demonstrates a simple reduction operation applied to the data. Upload payload (in this case a reduced version of the original data file) to MOVEit Transfer. 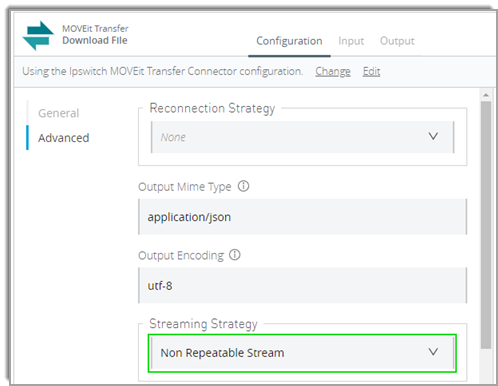 MOVEit Connector provides a new streaming capability which is ideal for processing large file downloads while avoiding webservice maximum size restrictions or disrupting bandwidth or services availability for other users. Best practice for most cases will be to use a Non-repeatable Stream. For a detailed reference on Streaming Strategies, see the MuleSoft documentation titled Streaming Strategies Reference. The following table outlines typical MOVEit content transfer and file management operations. For details see the MOVEit Transfer Connector Reference Guide and the "circle i" ( ) help information in the Design Center or Anypoint Studio UI. • Flow or subflow payload content. • Folder ID. Required value. • Hash/Hash Type. Optional. Add signature hash of file so MOVEit can verify transfer integrity after upload. Download payload or mule variable information to a file from MOVEit Transfer. • File ID. Required value. Get file modified date, ownership, size, upload verification, and more. Download files from the specified folder. Get a list of files this user can access. File access is determined by org admins, or current folder permissions, and user, group, and site policy. Applications and connectors can use OAuth2 to retrieve or renew an auth token needed to transact with a deployed MOVEit Transfer Server. Where much of this behavior is automatic and normally part of the connector’s default configuration, this section can be helpful if you need to apply tokens directly from within your Mule application Flow. Typically, MOVEit connector operations use default connection profile. You can use this section if you feel the need to override this behavior. Normal. Use the default MOVEit credentials and target host with most of the connector operations. Credentials are Flow properties passed to the deployed MOVEit Transfer Server and an auth token is requested as part of the operation. 'In Flow' Call. You can add a MOVEit Get Token connector that enables/expects non-default user credentials and applies a grant type of password or refresh_token. You can configure a default user for a Mule Flow instead of explicitly getting and revoking auth tokens until you need to override this default. The default user scenario is illustrated in the section titled Getting Started. To override the default, such as when you need to sign on as a different user or a user affiliated with a different org, you can fetch, renew, and cancel (revoke) an auth token using the auth token management operations (Get Token and Revoke Token). Change user in the middle of a Flow. Apply privileged access management measures, for example. Change orgs in the middle of a Flow. Some users belong to multiple orgs. Batch execution of user-level operations. Per-user onboarding, validation, and testing, aggregation across orgs, and much more. Retrieve or Renew an access token. Given a valid refresh token, provide the refresh token (Grant Type = "refresh_token") to get a new token. Notify server that token is no longer in use. Revoking the token is best practice after use. After the initial password token grant, it is best practice to use access tokens when you access MOVEit Transfer. This section demonstrates simple 'in flow' leverage of Get Token. This example is helpful for scenarios where your task needs to change MOVEit users or orgs within the course of a single flow. This example flow applies the sequence outlined in the following table. Scheduler shown here just for simplicity. Pass in user/password pair and get back an access token and a refresh token. Payload: User-specific token object containing both auth and auth refresh tokens. Save auth token to a Flow-wide variable. Get Current User shown here for simplicity. After current user transactions for the current user with MOVEit are complete, notify MOVEit that it can cancel the auth token for this user. Canceling active auth tokens that are not needed is best practice. Integrating managed file transfer/access into workflows where it is needed. Applying consistent user access and tracking to secure files and messages. Most user management operations require admin-level permissions. The simplest case for using this library is to check the information for the current user. To do this, simply run Get User Details with the User ID set to "self". This works for all levels of registered user --such as TempUsers, Admins, and Users (often referred to as "regular users"). Using Get User Details (Self) is a useful way to judge if the current user has the appropriate level of user role needed to perform create, modify, and delete management actions. This example yields a JSON properties object including the permission field value that indicates that the current user has MOVEit Transfer Admin permissions. The following table outlines typical MOVEit User Management operations. Retrieve role and properties for a user. • Self. To get my information (current user). • any-user-id. Specify a user ID for the user. Retrieve role and properties for current user. Retrieves same information as Get User Details (Self). Retrieve current groups specified user belongs to. Get a list of members back for a given Group. Content managed by MOVEit can be organized and subject to access permissions and policies applied to folders. Folders can use a strict, inherited policy of user access control, or can be permissive and collaborative (while maintaining an audit trail and even while applying DLP rule checking). For convenience, consistency, and alignment, you can manage many folder operations from within your Mule Flow. Before you can write to or download a folder, you need read or write access (respectively) to that folder. Use the List Folders operation to return a list of folders the current user can access. The following example Flow gets a list of folder properties objects available to the current user (effectively the folders accessible to the user) and then uses the Transform module to reduce it to a list of folder paths in the MOVEit Transfer org together with the time they were last changed. The following table outlines typical MOVEit Folder Management operations. Copy file from specified folder to a specified folder. Create a subfolder in the target folder. Delete a folder from MOVEit Transfer. Get folder access control information. Get list of folder contents. Get subfolders in the current parent folder. Get a list of all folders the current user can access. Update folder attributes and access information. Put file in specified target folder. Follow these instructions, when you are ready to run, clone, and re-purpose any of the examples in this guide using the Anypoint Studio interactive development environment. These instructions are helpful if you have used Anypoint Studio or other similar interactive development environments and you have a .jar to import from Design Center, such as one produced from the section titled Getting Started. 2. Find a Flow you can run successfully, and click the Flow’s name. 3. Download the Flow’s package (.jar file). 1. From Anypoint Studio, import the .jar file (File > Import). 2. From the Import Select dialog box, Select Anypoint Studio > Packaged mule application (.jar) as the import wizard to apply to the import action, then click Next. 4. Click Finish and if you are prompted, allow Anypoint to retrieve required build dependencies by clicking Perform Update at the Update your Workspace dialog. 1. From the Project Menu, choose Build All. 2. After your project completes building, select the Run menu, and then choose Run.